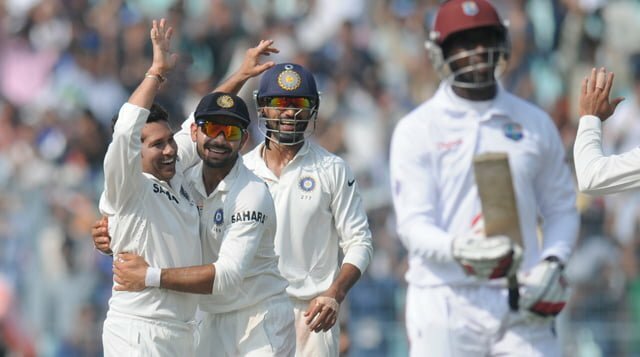 India convincingly won the First Test against West Indies in 3 days. This win was India’s EIGHTH win by an Innings under the Captaincy of MS Dhoni. Now he shares the Indian Record of Winning most tests by an Innings margin with Mohammad Azharuddin. This win was MS Dhoni’s 25th win as captain. He became FIRST Indian and 11th overall to do so. This win was India’s THIRD win by an Innings margin against West Indies. India had beaten West Indies by an innings and 112 runs at Mumbai (Wankhede) in 2002-03 and by an innings and 15 runs also at Kolkata in 2011-12. This is the NINTH instance of India winning a Test inside 3 Days, SECOND against West Indies. Mohammed Shami and Rohit Sharma were making their Test debut for India. They became the 279th and 280th players to represent India in Test cricket. Mohammed Shami was only the THIRD Indian Fast bowler to claim FIVE wicket haul in Debut Match and EIGHTH Indian bowler to do so. Mohammed Shami’s figures of 4 for 71 are the best for an Indian making his debut at the Eden Gardens, surpassing Ghulam Ahmed’s 4 for 94 also against West Indies in 1948-49. M Shami’s figures are also the THIRD best by an Indian pacer on debut in first innings of a Test, after Abid Ali’s 6 for 55 (vs Australia, Adelaide, 1967-68) and Mohammad Nissar’s 5 for 93 (vs England, Lord’s in 1932). All Top THREE match figures for India in Debut match came against West Indies Hirwani’s 16/136 and Shami’s 9/118 are followed by R Ashwin’s 9/128 at Delhi in 2011-12. 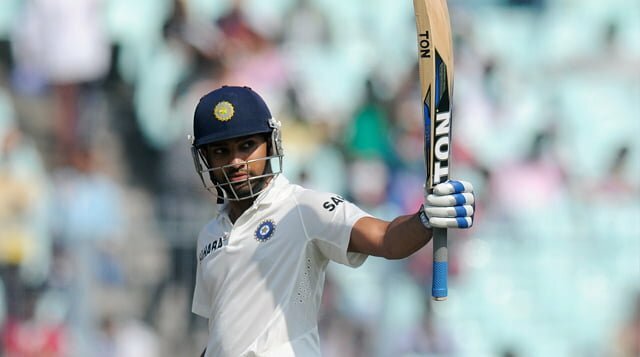 Rohit Sharma’s 177 is the highest score by No.6 batsman on Debut. Rohit Sharma is Only FIFTH India player to win Man of the Match Award on debut, SECOND player after Dhawan this year. R Ashwin Scored his SECOND Test hundred. His FIRST Test hundred also came against West Indies. R Ashwin became the EIGHTH Indian to remain unbeaten in the 90s at close of a day’s play against West Indies. All of them managed to reach the three-figure mark the following day! 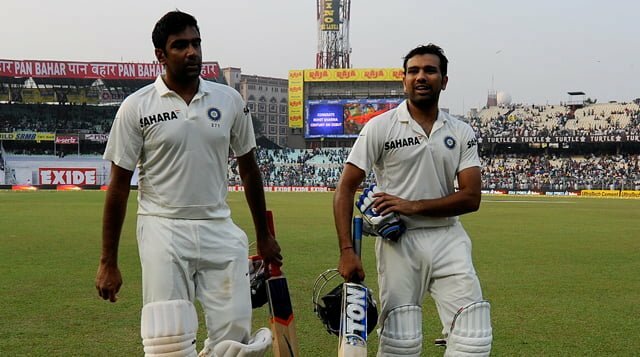 280 run partnership between Rohit Sharma & R Ashwin for SEVENTH wicket is highest for India, beating VVS Laxman and MS Dhoni’s 259 runs unbeaten partnership against South Africa in same venue. R Sharma & R Ashwin partnership is also THIRD highest in all Test Cricket, after the 347-run partnership between Denis Atkinson and Clairmonte Depeiaza (for West Indies vs Australia at Bridgetown in 1954-55) and the 308-run partnership between Waqar Hasan and Imtiaz Ahmed (for Pakistan vs New Zealand at Lahore in 1955-56). Shane Shillingford became only the SECOND West Indies spinner to take a SIX wicket haul on Indian soil, after Lance Gibbs, who did so twice – 7/98 at Mumbai (Wankhede) and 6/76 at Delhi in 1974-75. Shane Shillingford’s figure is also SECOND best by a Visiting Spinner at The Eden Gardens. Shivnarine Chanderpaul, while batting on 13 in the Second innings, completed his 20,000 runs in international cricket. He became SECOND West Indian, after Brian Lara (22,358) and TENTH player overall, to reach this mark. Sachin Tendulkar became the SEVENTH Indian to play a Test after turning 40, after Rustomji Jamshedji, CK Nayudu, Cota Ramaswami, Vijay Merchant, Lala Amarnath and Vinoo Mankad. Sachin Tendulkar is playing his 13th Test at the Eden Gardens which is most by an Indian at a particular ground. He shared the record previously with Sunil Gavaskar, who played 12 Tests at Chepauk, Chennai. This Test is Sachin’s 93rd home Test. With this he surpassed Ricky Ponting’s record of playing most (92) home Tests. Sachin Tendulkar’s wicket of Shane Shillingford was his FIRST in Test cricket after a gap of 33 months. His last wicket had come against South Africa at Cape Town in January 2011 (victim: Mark Boucher). Incidentally, Tendulkar’s last Test hundred had also come in that Test! Previous articleWhat is NCAA Basketball?